Weird can mean a lot of things, but in this case it is a good thing. An economist recently did a study based on 20 different variables to see which metro areas had the most deviations from being "normal." The metrics included the proportion of the population that is foreign born, married, working, in the military, that own a car, etc. The San Jose metro came in as the most "weird" city in the US whereas Oklahoma was the most normal. San Jose ranked so highly due to our large percentage of immigrants, workers with high education, and high salaries. 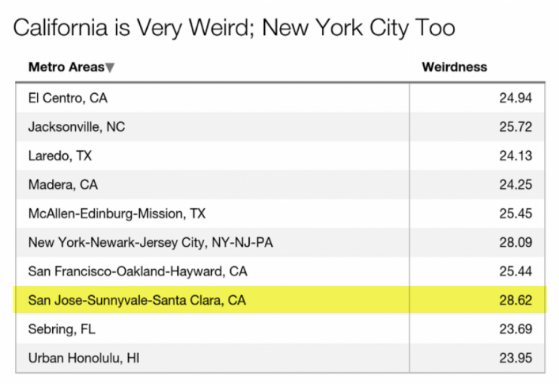 New York came in second on the "weirdness" list. Source: Washington Post, hat tip to Fuss Lopez for sending this in!